LIMA - Peru's foreign minister said on Monday that she and US Secretary of State Rex Tillerson had agreed to keep working together to fight drug trafficking, days after President Donald Trump had threatened to curb aid to drug hotspots. "The secretary of state has recognized Peru's efforts to combat narco-trafficking. 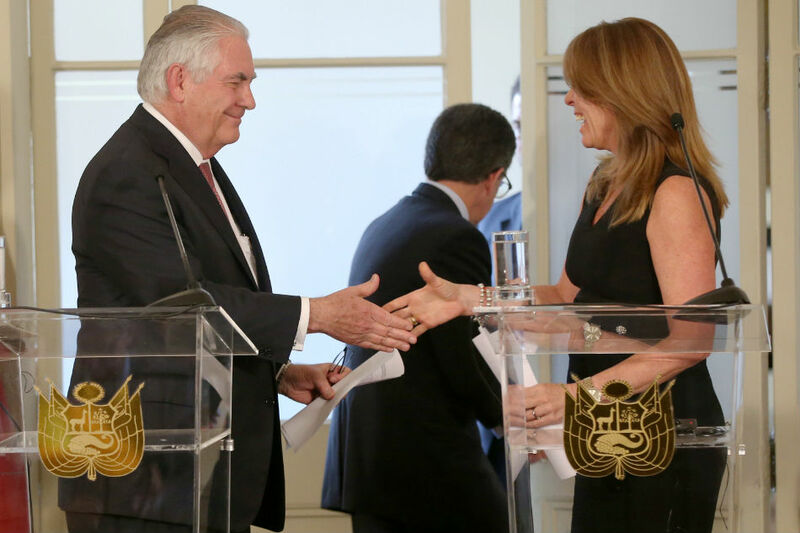 ... We have agreed that we must continue to join forces in this fight," Peru's Cayetana Aljovin said in a joint news conference with Tillerson. Trump said on Friday that unnamed countries were "pouring drugs" into the United States, calling to "stop the aid" after a US Customs and Border Protection official told him that cocaine was primarily coming from Colombia and Peru, and trafficked through Mexico and Central America. Tillerson, who has at times contradicted Trump on foreign policy, struck a more conciliatory tone. "The US is victimized certainly by the flow of narcotics to the US, but the countries in which these narcotics are transited, or where organizations are carrying out their activities to move these drugs, they also suffer as well," he said. Tillerson said the United States has been in "clear dialogue" on drugs with Mexico, the first stop on his tour. "The US has to acknowledge that we are the market. We are the largest consumer of illicit drugs and so we have to begin to work on that problem," he said, adding that Trump had designated $1 billion to solving it. He also praised the Peru-United States free trade agreement and said Trump would be wiling to look at the so-called TPP 11 agreement to be signed in March, after the United States pulled out of plans for a 12-nation Trans Pacific Partnership. "We haven't rejected that (TPP 11) out of hand but we also have very strong trade agreements already in place with many of the countries in this hemisphere and we should use those fully," Tillerson said. Tillerson on Tuesday will head to Colombia, which received some $10 billion in funding from 2000 to 2015 for military and social programs through the so-called Plan Colombia.